Today we welcome Legally Blonde & Broke, the writer of a blog dedicated to sharing tips for getting through law school and life successfully. Thanks, LBB! Walking and biking have been on the rise, as people are looking for healthier and environmentally-friendly travel options. While cities around the country have begun to implement bike-share programs and city planning to take pedestrians into account, pedestrians and cyclists still remain at an inherent disadvantage compared to vehicles. Pedestrian accidents have been steadily increasing in the past few years, both in the number of pedestrian deaths and percentage of incidents. In 2016, almost 6,000 pedestrians were killed in traffic crashes in the United States, which accounts for almost 16% of all traffic fatalities. This is a 9% increase from 2015. As more Americans than ever are walking, biking and sharing the roadways, the dangers of pedestrian accidents continue to steadily increase. Surprisingly, more than 80% of all pedestrian accidents do not occur at street crossings, but on the sidewalks and streets. Delaware, Florida and South Carolina were found to have the highest pedestrian fatality rates in 2015. 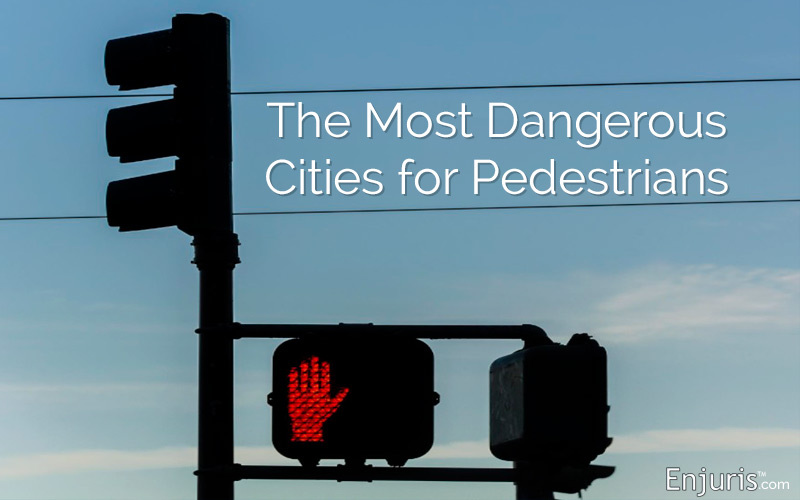 Several large cities in Florida top the list as the most steadily increased number of pedestrian accidents, including: Cape Coral, Orlando, Miami, Jacksonville, West Palm Beach, and Sarasota. This was found to be related to a high level of tourism, a healthy economy, and a surge of vacationers escaping the cold weather. California, Texas, Florida, and New York accounted for almost half of all pedestrian fatalities in 2017. Other notable cities included Memphis, TN, Baton Rouge, LA, Detroit MI, and Phoenix, AZ. To address this, the Governors Highway Safety Association released A Right to the Road: Understanding and Addressing Bicyclist Safety, a report that analyzes nation data and illustrates steps to be taken to reduce fatalities and accidents. Several states and cities are also taking action by implementing programs to help motorists see and avoid pedestrians and cyclists in the hopes that there will be a decrease in fatalities in the coming years. Be visible – Make sure you are visible to drivers at all times, and try to make eye contact with them when possible. This is important at night and in low-light conditions, including inclement weather. Wear lightly-colored or reflective clothing, and try to stay in well-lit areas, especially when crossing the street. Avoid distractions – As a pedestrian, your eyes and ears are your best tools for avoiding dangers. Put down your phone and take out your headphones so that you can see and hear what is around you. Follow the rules of the road – Know and follow traffic rules, signals and signs. Be aware of the rules of vehicles around you so that you can anticipate what drivers might do. Never assume that a driver will give you the right of way. Try to make eye contact and stop until you are certain the vehicle is letting you cross the road. Walk in safe places – Use crosswalks when crossing the street. If a crosswalk is unavailable, be sure to find spots with good lighting so that drivers can see you. Make sure there is a sufficiently large gap in traffic before you decide to cross the street. Avoid alcohol consumption – Most of the traffic incidents that occur involving pedestrians involve the use of alcohol or drugs. When you know you will need to walk or be near traffic, avoid alcohol consumption so that you can remain alert. Be alert – Look out for pedestrians at all times while driving. Pedestrians are often not where they should be, especially children, so make sure you remain vigilant of those walking or riding a bicycle at all times. Make sure to follow the speed limits and slow down when approaching pedestrians. This is especially important near crosswalks and school zones. In low light and inclement weather, make sure your headlights are on and that you use your signals properly. Use extra caution near crosswalks – Always yield to pedestrians in a crosswalk and reduce speed when approaching one. When you are stopped, allow yourself enough room between your vehicle and the pedestrians, and make sure that you have allowed them enough time to cross the street. Do not pass other vehicles that are stopped at a crosswalk. When stopped behind a school bus or city bus, make sure that every passenger has left the bus and has made it safely to the sidewalk before driving. Have you ever experienced a pedestrian accident? Let us know in the comments!